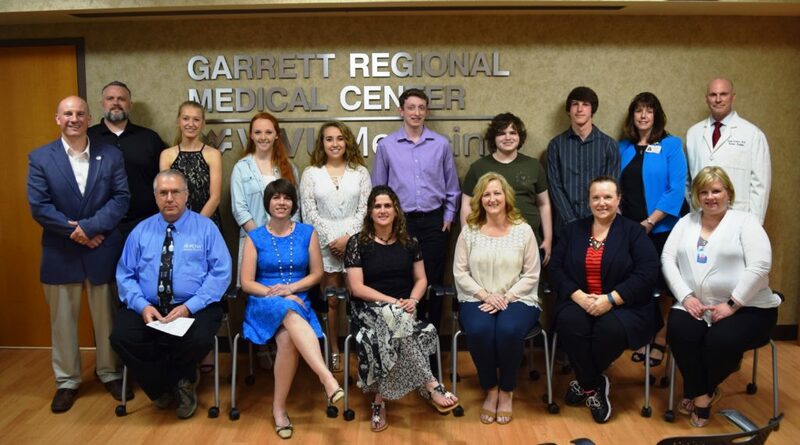 Garrett Regional Medical Center was proud to host the inaugural Garrett County Schools Biomedical Science White Coat Ceremony that consists of high school juniors and seniors who completed Project Lead the Way. The ceremony took part in collaboration with Garrett County Schools, Mountain Laurel and GRMC. During the event, students shared presentations of their program projects with parents, school instructors and staff from GRMC, Mountain Laurel and AHEC. Pictured left to right includes Brian Price, Rebecca Kenyon Sisler, Kista Powell, Brenda Strosnider, Diana Marks, and Melissa Clark and standing left to right includes Paul Edwards, Charles Wilt, Jenna Yommer, Cheyenne Biser, Emilee Tasker, Isaac Brenneman, Jonathon Roy, Trey Rouse, Kendra Thayer, Dr. Stanley Lambert.